This post content also a part of Wellon Transformer review. 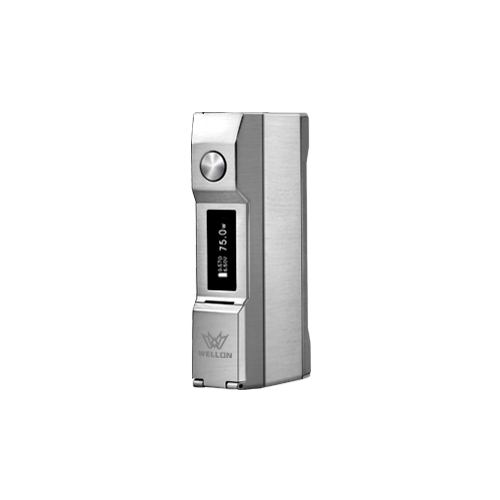 Go deep for more detail Wellon Transformer Mod Introduce from majorvapes. We are going to from three parts dicuss Wellon Transformer Mod. The mod is pretty straight forward without a ton of bells and whistles but works well for what it is. It’s a 75w zinc alloy regulated mod that uses a single 18650 battery. It’s 82mm tall, 42mm long and only 22mm wide so it’s rather small for a single 18650 mod. The one standout feature of the mod would probably be the magnetic flap that is used to protect the adjustment buttons when not in use. It’s a nice little feature but I think a button lock would have done just as good of a job. For safety the mod also features the usual protections like 10s puff cutoff, short circuit protection, open circuit protection, high temp and reverse battery. At the top it’s got a 510 connection with stainless steel threads and what looks to be a gold plated spring loaded positive pin. I’ve tried quite a few tanks and drippers on it and they all seemed to sit flush without any noticeable gap. Surrounding the 510 connection is a bit of embellishment carved in to the mod, it kind of reminds me of a spider but I don’t know if that was intentional. Down the face of the mod you’ve got what look like SS buttons for firing the mod as well as for making adjustments. The fire button is round and almost flush with the mod, it’s a little clicky and works well without any rattle. The adjustment buttons as I mentioned are hidden under a little magnetic flap and they are also clicky but they have quite a bit of button rattle, the cover helps mitigate some of it but you can still hear them rattling underneath. Between the fire and adjustment buttons you’ve got a fairly bright OLED screen with a fairly standard layout depending on what mode you are in, I’ve included screen shots in the album. All the way on the bottom of the mod you’ve got the micro usb charge port. I didn’t see any listing of it being upgradeable so it’ll just be for charging only. I personally would have preferred the charge port be on the side so you can leave it standing up while charging but that’s a minor complaint if the tank doesn’t leak. Now since I’m not P. Busardo or DJLSB I didn’t run any kind of accuracy or performance tests on the mod but I did test out all of the features and can say in the week+ that I’ve been using it it’s performed flawlessly. I’ve tested out the variable wattage and temp control features and both seem to function accurately. Aside from TC modes the mod itself has very few options other then flipping the screen. Locking resistance comes with the new coil message like many mods do and I wasn’t able to find a button combination to lock it. With no firmware updates this thing is rather simple and will stay that way which to me will be welcome by many novice users. The OLED screen I mentioned above has all the information one needs and while in VW mode it shows the resistance of your coil, the voltage it will fire at and the current wattage it’s set to. While in TC mode it shows the current TC material, the resistance of your coil, the wattage it will fire at and the current temperature. I couldn’t figure out a way to change the wattage while in TC mode so it might be set to 75w and that’s it but the temperature can be adjusted from 200-600F, I also didn’t notice an option for Celsius. Previous PostHave you Attempted New way for vape quit smoking?